The passion flower belongs to a group of approximately 450 species of predominantly evergreen, woody climbers that grow in tropical woodland in North, Central and South America, with a few outliers in Australasia. In favourable conditions, the vines grow vigorously and quickly as garden plants, and are easy to support with their numerous tendrils. The flowers are unusual and very exotic-looking, and on many varieties they are followed by colourful fruit in good summers. The flowers are attractive to butterflies and bees, and in their native South America many are pollinated by the striking Heliconiinae or longwing butterflies, large bees, hummingbirds, or even bats. Some species produce clumps of small growths on the leaves that resemble butterfly’s eggs, while others secrete fluids that attract ants. Both measures are aimed at deterring butterflies from laying eggs on the leaves and thus avoiding defoliation by their caterpillars. The hardier varieties are best grown in a sunny and sheltered spot, while the more tender types can be grown in containers to be wintered or kept year-round in a greenhouse or conservatory. The passion flower is associated with a great deal of religious symbolism, and the name refers to the passion of Jesus in Christian theology. Early Spanish missionaries to South American likened parts of the plant to Christ’s crown of thorns and the crucifixion nails and wounds, and believed that the typical purplish-blue and white colours of the flowers represented heaven and purity. This is the blue passion flower, and perhaps the most commonly encountered variety in UK gardens. It is hardy, though still appreciates a sheltered and warm spot, where it is more likely to retain its leaves over winter. The flowers are up to 8cm in diameter, mostly white but sometimes tinged pink, with striking purplish-blue filaments erupting from the centre. The flowers are followed by yellowy-orange, egg-shaped fruit in late summer. ‘Eden’ is a vigorous climber with large, dramatic flowers with purple ‘petals’ that are white towards the centre. It is evergreen, and has been awarded the RHS Award of Garden Merit. Another Award of Garden Merit winner, this ivory-white flowered variety has additional interest due to its fragrant blooms. As its name suggests, Grandiflora has unusually large white and violet flowers that grow up to 15cm in diameter. ‘Amethyst’ (also known as Passiflora Lavender Lady) has the RHS Award of Garden Merit and is fully hardy. Its rich violet flowers have contrasting green filaments, and the ‘petals’ reflex and darken as the flowers age. Other good purple-flowered varieties include Passiflora ‘Purple Rain’ and the hybrid Passiflora x voileacea. This species is commonly known as the banana passion flower because of its long, golden-yellow fruit. These follow on from clusters of atypical hanging pale pink tubular flowers. It is a very fast-growing vine and while attractive in a UK garden, it has naturalised and become an invasive weed in some areas of Hawaii and New Zealand. It requires a minimum temperature of around 5°C so is best grown in a glasshouse or conservatory. This species is commonly known as the wing-stem passion flower or fragrant granadilla. It has scented, deep red flowers with a banded corona in red, purple and white from June to October. The fruit are edible. It grows to 6m or more. It can be planted out after mid May in a sunny and sheltered garden spot in the warmer parts of the UK, but it will need careful protection through a cold winter. ‘White lightning’ is one of the favourite white varieties of passion flower. The ‘petals’ are slightly creamy white and the flower has a green centre with just a hint of purple on the filaments. It is hardy and will reach 4m in height. One of many red-flowered varieties, the giant granadilla or square stemmed passion flower bears fragrant deep-red flowers with a central mass of reddish-purple, white and pink-banded, wavy filaments. It has the RHS Award of Garden Merit. It is a vigorous, scrambling tropical vine that needs a lot of space in a heated greenhouse, where it will need to be kept all year round, as it requires temperatures above 15°C. This Colombian species, known as the red banana passion flower, is difficult to come by but well worth the search effort. It has downy 3-lobed leaves and huge, 15cm, red flowers on 50cm pendulous stems. It is too tender for UK gardens, but makes a spectacular plant for a large conservatory. The red passion flower has bright red, comparatively small flowers, the very centres of which are bluish-white. The flowers are followed by 5cm-long, green fruit. It is available as a number of cultivars, including the popular ‘Red’. It dislikes temperatures below 7°C so is best raised in a pot that can be brought into an unheated greenhouse or conservatory over winter. Another red-flowered species, this striking, evergreen, 5m-tall vine is a native of Brazil that bears dangling clusters of showy, scarlet flowers that can hang up to 30cm in length and grow to 12cm in diameter when fully open. The fruits are oval and green and around 7cm long. Passion flower plants are generally bought in 9cm pots and are ready for planting out at any time of year, though not when the soil is frozen or there is a danger of frost. 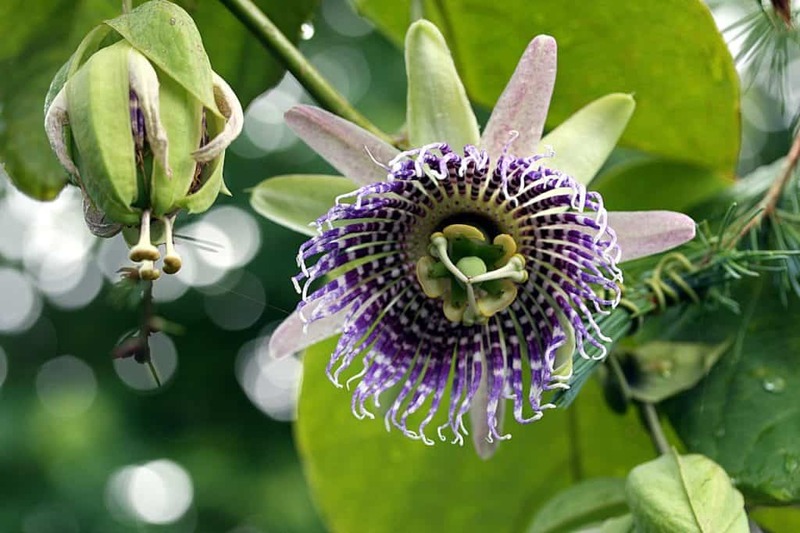 The most popular varieties such as Passiflora caerulea are available from larger garden centres, while specialist nurseries carry a wider selection of species and cultivars. When selecting a variety, make sure to match the garden’s growing conditions with the plant’s requirements, especially in relation to hardiness. They will all appreciate a warm, sunny and sheltered position, but some types are only hardy in the warmest and most sheltered parts of the UK, and some are only reliable in containers that can be brought into the conservatory of greenhouse for the winter. In general, the blue and white varieties are the hardiest. A passion flower plant will climb quite happily up a trellis using its tendrils, but for security of support, wires should be used on fences and walls, with growing stems loosely tied into these until the tendrils take over. Before planting a new passion flower into its pot or garden position, water it thoroughly in its nursery pot. Prepare the ground by digging a hole twice the diameter of the pot and at least 15cm away from the wall, fence or trellis that is being used to support it. Dig garden compost into the base of the hole and position the plant and its supporting cane in the hole so that the cane leans across and touches the support. The top of the root ball should be level with the surrounding soil. Add more compost into the soil used to refill around the plant. Tie the stems onto the support and water the plant in well. 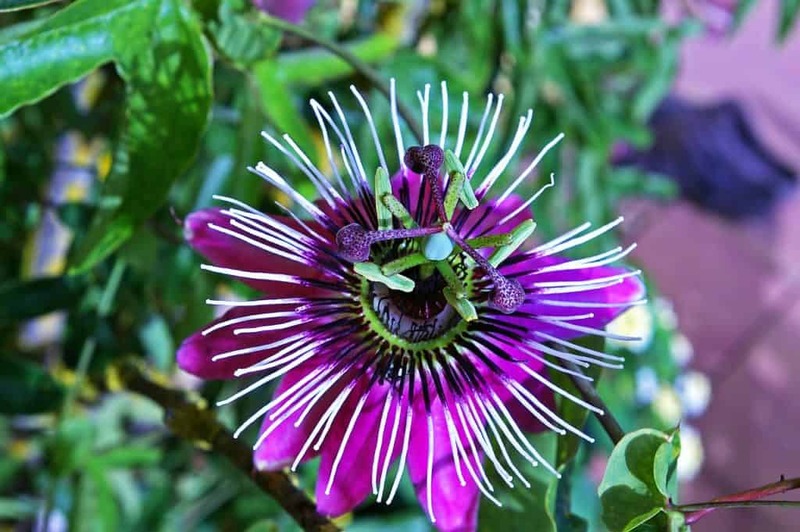 Passion flowers prefer full sun or dappled shade in a position that is well sheltered from cold, drying winds. A south, south-west or west aspect wall is ideal. Plants grown in a greenhouse or conservatory may need some shading from direct afternoon sunlight in the summer to avoid scorching of the leaves. New passion flower plants should be watered frequently and thoroughly during their first year in the garden or pot. Continue to water them well during following summers, especially those grown in containers and pots. Garden plants will not subsequently require winter watering except in prolonged dry periods on free-draining soils, and container specimens can be watered more sparingly outside the growing season, allowing the surface of the compost to begin to dry out between each watering. The passion flower prefers moderately fertile, well-drained but reliably moist soils, though it will grow quite happily in most normal garden soil types within the typical range of acidity and alkalinity. Regular feeding is not usually necessary for garden-grown passion flowers, and the use of nitrogen-heavy fertilisers can lead to excessive foliage and stem growth at the expense of flowers. If the vitality of the plant does seem to decline, the plants can be top-dressed with blood, fish and bone or a general fertiliser at approximately 50g per square metre of ground. Plants in containers should be given regular fortnightly feeds during the growing season with an organic liquid plant food. New plants from the nursery that are to be grown on in containers should be transplanted into 18cm diameter posts. Some gardeners believe that passion flower plants bloom more profusely when their roots are restricted, so monitor the plant carefully and pot them on only when necessary, probably every three to four years. Use John Innes No 3 potting compost or a similar good quality, peat-free compost. A passion flower vine may need to be pruned in three situations. The first is to train a young plant into a desired shape and form. The second is to promote bushier growth generally, and the last is to rejuvenate damaged or neglected plants. While the passion flower vine is a perfectly capable, self-clinging, tendril climber, it is also attractive if fan-trained. This will give the plant a cared-for look in a more formal part of the garden. After planting out a new vine, cut back the growing tips of all of the plant’s shoots to promote branching at the base. As they develop, tie the selected framework shoots into horizontal wires or a trellis to encourage the typical fan shape, remembering to leave sufficient space between the fan elements to display the hanging flowers of pendulous varieties. Once established, fan-trained plants can be pruned in spring to remove extended shoots and any frost damage. An annual prune after flowering to reduce side shoots to a couple of buds from the main fan framework will help maintain the shape. An annual pruning of a less formally grown vine will promote a bushier form and thicker, stronger stems, and may help to produce more flowers and fruit. More vigorous specimens that are threatening to outgrow their space and swamp surrounding plants can be trimmed as necessary during the growing season to keep them in check. Overgrown, neglected or frost-damaged passion flower vines can be given a renovation pruning in the spring. Cut each stem back to a bud or side shoot approximately 50cm above soil level. New green shoots will develop quite quickly and these can be thinned and trained to shape if desired. This hard pruning will rejuvenate the plant but it may reduce the abundance of flowers for the next couple of years. Passion flowers can be propagated from seed, softwood cuttings in spring, semi-ripe cuttings in summer or by layering. Layering is the simplest and most reliable technique, and it creates new plants with the same characteristics as the parent. For successful softwood cuttings, remove a length of healthy new vine with a clean, sharp knife. Trim the cutting to about 10cm, making the lower cut in new growth just below a leaf joint. Remove all leaves and tendrils from the lower half of the cutting and plant into a pot of free-draining compost, such as a 50:50 mix of potting compost with sharp sand or perlite, after dipping in hormone rooting powder. Species passion flowers will come true from seed, but not the named cultivars. To prepare the seed, allow the fruits to ripen on the plant, harvest them, and keep them for two weeks indoors on a tray in a cool, dry, ventilated place, individually lightly wrapped in kitchen paper. Keep them apart and dispose of any that show signs of disease or rot. During this time, the fruit will begin to ferment and this will help to prevent the development of fungal diseases that might later affect the young seedlings. At the end of two weeks, pulp the fruits in a bowl and stand this in a warm place such as an airing cupboard to ferment for a further three days. Then sieve the pulp under cold, running water to separate the seeds. Once they are clean of all pulp, dry them on clean kitchen paper overnight. The next morning, put them into a bowl of hot water and leave them another 24 hours. This will soften the seed coat. The seed should then be sown the following day, as it does not store well. Fill a seed tray with John Innes seed compost, or use an equal mix of multi-purpose compost and perlite. Firm the compost well, water liberally and then carefully place the seeds onto the surface of the compost, about a finger’s width apart. Cover the seed with a 5mm deep sprinkling of sieved compost. Cover the tray with a propagator lid or a supported clear plastic bag and keep the compost moist. For the best chance of success, the tray should be kept at 20°C for 16 hours and 30°C for 8 hours each day, or as a second-best, at a constant temperature of 26°C. Germination can be slow and the timing unpredictable, as the seed contains a germination inhibitor. The first seedlings may appear within a month, and viable plants may continue to appear for up to three months. Prick them out into individual pots. The seedlings can be hardened off and transplanted into the garden once they have four or five true leaves. Plants may be attacked by aphids, and when grown under glass the vines are susceptible to greenhouse pests such as red spider mite, whitefly, scale insect and mealybug. 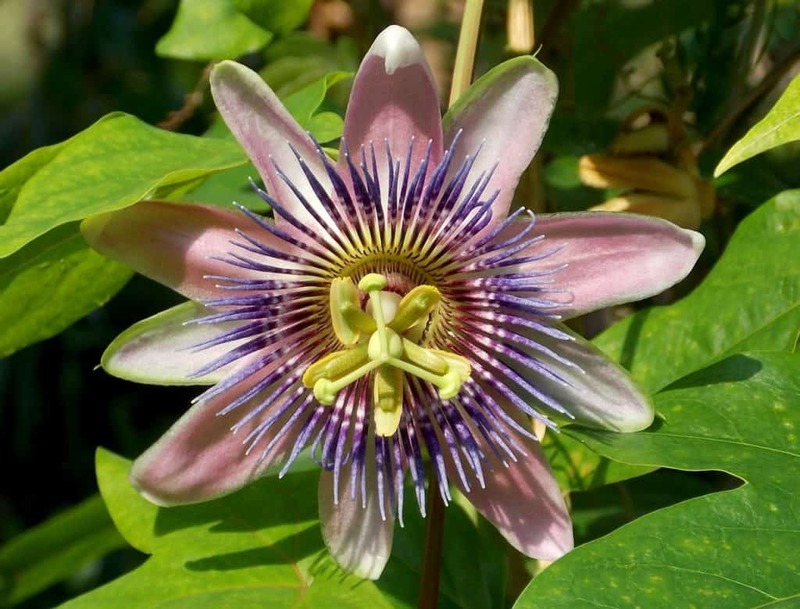 Passion flowers are somewhat prone to plant viruses, especially the cucumber mosaic virus. The virus is transmitted by cucumber beetles and aphids, and it can also spread directly between plants growing in close proximity or through infected seed. Affected plants have a mosaic mottling and distortion of the leaves, and growth may be stunted. Infected plants should be destroyed and the normal rules of garden hygiene applied. They can also suffer from bacterial disease such as Xanthomonas bacterial spot. Again, any affected plant should be destroyed and one of the more resistant varieties chosen to replace it. Q Presumably the passion flower plant produces passion fruits, which are edible? The passion flower is famous for its fruit that is said to have mysterious and aphrodisiac qualities. A good, ripe passion fruit has a characteristic aromatic flavour that is unlike any other fruit. However, these fruit are from the species Passiflora edulis, a tender tropical species that requires minimum temperatures of around 15°C. The hardier varieties grown in UK gardens can produce egg-shaped, orange fruits in warm summers. They can be eaten when fully ripe, but they do not have the same taste or qualities as the tropical fruit. Under-ripe, yellow fruits can cause stomach upsets, and other parts of the vines should not be eaten.